KARACHI: State Bank of Pakistan (SBP) on Thursday decided to further increase key policy rate by 25 basis points to 10.25 percent for next two months effective from February 01, 2019 on concerns over increase in inflation. The Monetary Policy Committee (MPC) noted that the impact of stabilization measures implemented so far is gradually unfolding and confidence is improving amidst reduced economic uncertainty, but (i) the fiscal deficit is yet to show signs of consolidation despite a reduction in PSDP spending; (ii) although a gradual improvement in current account deficit is visible, it remains high; (iii) a marked shift in the pattern of government borrowing from scheduled banks to SBP entails inflationary concerns; and (iv) even as stabilization measures gradually work through the economy, underlying inflationary pressures persist . The SBP in a statement said that the economic data released after the last Monetary Policy Committee (MPC) meeting in November 2018 confirms that the stabilization measures implemented during the last twelve months are taking hold. Key monthly indicators are showing visible signs of deceleration in domestic demand. The current account deficit is narrowing, albeit gradually. This, along with an increase in financial inflows are contributing to reduced pressures on the country’s external accounts. These developments are encouraging and have served to reduce some economic uncertainty. However, challenges to Pakistan’s economy persist: (a) despite narrowing, the current account deficit remains high; (b) fiscal deficit is elevated; and (c) core inflation is persistently high. This situation calls for continued consolidation efforts. Average headline CPI inflation stands at 6.0 percent for the first half of FY19, which is considerably higher than the 3.8 percent recorded during the same period last year. Meanwhile, headline YoY inflation has shown some moderation during the last two months, primarily due to a sharp fall in prices of perishable food items and a downward adjustment in prices of petroleum products. Despite these positives, core inflation as measured by non-food-non-energy components of the CPI basket has reached 8.4 percent in December 2018. 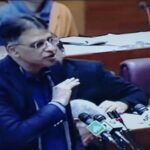 Going forward, the second round impacts of the exchange rate movements, upward adjustments in gas and electricity tariffs, and higher government borrowings from SBP are likely to be offset by the lagged impact of the increase in policy rates and the fall in international oil prices, on inflation. Accordingly, the projected range of inflation remains unchanged at 6.5 to 7.5 percent. The pickup in inflation and the continuation of economic challenges are taking their toll on economic performance. Real economic activity has witnessed a marked slowdown during the first half of the year. Large-scale manufacturing, which has strong backward and forward linkages, saw a net contraction of 0.9 percent during the first five months of this fiscal year, mainly due to a moderation in domestic demand and some sector specific challenges. Meanwhile, all major kharif crops have recorded a decline in production from last year’s levels. The initial assessment of the wheat crop is also not encouraging. Both, the direct and the knock on, impacts of changes in commodity producing sectors on the services sector, is likely to reduce real GDP growth for FY19 to around 4.0 percent, well below both the annual target of 6.2 percent and the 5.8 percent growth realized in the previous year. This growth is largely attributed to higher cost of raw materials (cotton, petroleum products, etc), continuation of capacity expansion in power and construction-allied industries (especially cement and steel), and favorable liquidity conditions due to retirement of government borrowing from commercial banks. In absolute terms, net budgetary finance from SBP reached Rs 3,770.5 billion during 1st Jul-18th Jan FY19, which is 4.3 times the amount borrowed during the same period last year. This financing will potentially have inflationary consequences in the future. A major chunk of this borrowing was used to retire government debt from commercial banks (a net retirement of Rs 3035.8 billion). Both the healthy credit offtake and higher government borrowing were the primary contributors to a higher broad money (M2) growth of 2.2 percent during 1st Jul-18th Jan FY19 as compared to 1.1 percent during the same period last year. The fiscal deficit for first half FY19 is likely to be higher than the same period last year. This shows that despite a sharp cut in PSDP releases and rationalization of tariffs and duties, fiscal consolidation remains a challenge. On external front, the current account deficit (CAD) recorded a YoY reduction of 4.4 percent during the first half of the year to US$ 8.0 billion. This improvement is largely driven by a sharp deceleration in import of goods and services. The impact of stabilization measures is amply visible from non-oil imports, which saw a contraction of 4.4 percent during the first half of FY19 against an increase of 19.1 percent during the same period last year. A marginal increase in exports and a healthy growth in remittances also helped contain the current account deficit. The financing of CAD, nevertheless, remained challenging as the private (Foreign Direct Investments and private loans) and official inflows were insufficient to completely finance the deficit. However, the realization of bilateral official flows in the last few days has helped increase SBP’s net liquid foreign exchange reserves to US$ 8.2 billion and the country’s foreign exchange reserves to US$ 14.8 billion as of 25th January 2019.